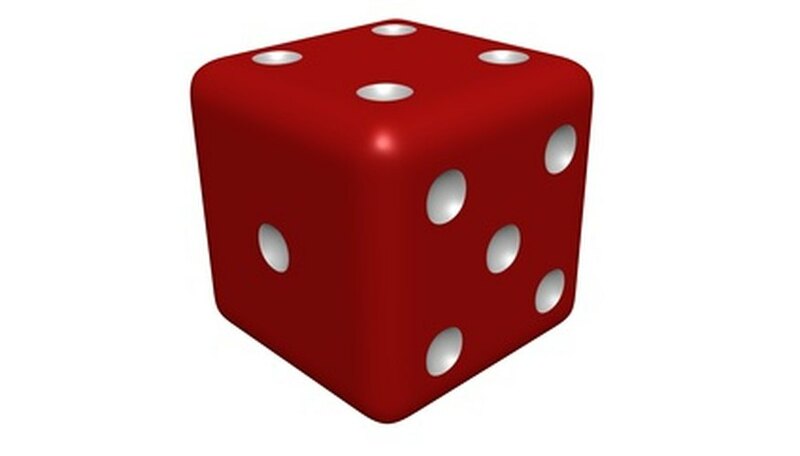 Dice are not only for games. They can also teach students about geometric forms and probability while they have a good time competing against each other. Whether you enjoy creating dice games at home or use them as lesson plans each year, a dice template can be handy to have around. It takes very little time to make and is easy to store. You just need a little time and a few simple tools to make a template that will last years. Place your ruler horizontally along the second grid line down from the top. Draw a line along the edge of your ruler that stretches across four half-inch squares. Repeat, drawing vertical lines on either side of your line and a second horizontal line completing your first square. Draw a second four-by-four square underneath your first, and two more squares underneath that. You should have 4 four-by-four squares stacked on top of each other in a vertical tower. Draw two more four-by-four squares, one on either side of the second vertical square. The result should be a cross shape. Trace around a single row of four squares at the top of the top square, at the ends and tops of the left and right squares, on the left and right of the third squares. These are glue tabs. When making dice, fold these tabs in and smear them with glue to seal your die. Cut out your shape and smear the back with an even coat of glue from a glue stick. Place the shape on a piece of thick card stock, smoothing it down with your palms. Pay special attention to the edges. Let the glue dry overnight and cut the shape out of the card stock with scissors. Store in a cool, dry place.